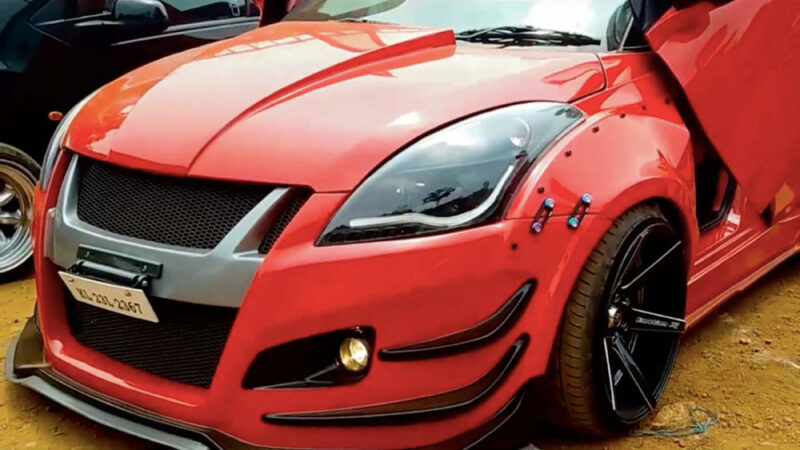 When it comes to modifying cars in India, the Maruti Suzuki Swift is among the top models in this list and we have already featured so many modified Swifts. This latest one comes from Kerala and it has lots of changes when compared to the stock model and it includes both aesthetical and mechanical updates. The changes start with new NKS body kit (front, side and rear skirts) as the front gets a new bumper with flared wheel arches. The grille is also new while the hood has been carried over and the headlamps are aftermarket units with projectors and LED DRLs integrated into it giving a sporty look for the Swift. The stock wheels have been replaced by 18-inch 6-spoke wheels with low profile tyres. The rear gets new aftermarket LED tail lamps along with a new bumper which has diffuser integrated into it and the Swift also comes with a big spoiler at the rear. The exterior is finished in a custom red colour. This theme continues to the interior as the stock three-spoke steering wheel has been replaced by a new aftermarket sporty steering with wood finish. The interior is finished in red and black colour, the sports seats also get this same colour theme. The stock music system has been replaced by a new JBL unit. The regular front doors have given way for scissor-type doors, which increase the sporty look. The stock suspension has been replaced by new Accuair air suspension and the ride height has also been lowered now. The modified Swift also gets twin exhaust and the engine might have also got some performance upgrades. The total cost of modification is not yet revealed. Maruti Suzuki is offering the Swift with petrol and diesel engines. The 1.2 L K-Series petrol engine produces 83 PS of power and 113 Nm of torque while the 1.3 L diesel engine puts of 75 PS and 190 Nm. Both the engines are mated to a 5-speed manual or an AMT gearbox option.